I know that’s the case for a lot of local school leaders in Oklahoma. In fact, it’s a recurring theme throughout the country. School board members and educators feel under attack. For years now, our game plan has focused on defense. It hasn’t been te rribly effective. The prevailing narrative that public education is a failure isn’t true. Neither is it true that public education has served every child well. Our children are learning more during the course of their school years than children in any previous generation. Much of what many of us were required to memorize in school is now available with a just few seconds of Internet searching. High school graduation rates in the United States are higher than they’ve ever been. Public schools are still producing scientists, lawyers, teachers and public servants who are changing the world as we know it. That is not failure. At the same time, the business of teaching and learning has changed. Public education and educators must change with it. We’ve been guilty — we often don’t make changes quickly enough and aren’t always receptive to new ideas. In that resistance or simply inaction, educators left a void. Others were only too happy to step in and lead critical conversations about reforming education. Educators were on the outside looking in. And when we didn’t like what we saw, we said “no.” We said “no” a lot. Predictably, that became the storyline. It’s been two years since I picked up the phone to hear my friend and fellow educator Steven Crawford talking about efforts in other states to focus less on reforming education and give educators the lead voice in a conversation about transforming education. Crawford, the executive director of the Cooperative Council for Oklahoma School Administration; Joe Siano, superintendent of Norman Public School; and Jeff Mills, the then-executive director of the Oklahoma State School Boards Association, wanted to start such an effort in Oklahoma. The time was right. I was frustrated with the contentious battle over reforms that looked much better on paper than they did in practice. Those of us who were working closest with students knew that despite some noble intentions, the reforms were implemented poorly, were disconnected from everyday reality, and would not improve public education for all children. By then, we were saying no in an echo chamber. Our voice was largely muted. But the idea of a new vision for public education in Oklahoma based on research and created by Oklahoma school leaders provided hope. It took two years for this group of dozens of dedicated and committed leaders to complete its work. The final report is 140-plus pages of research, recommendations and best practices we found in Oklahoma and throughout the country. For the People: A Vision for Oklahoma Public Education is a solid starting point for conversations in our communities and at the state level about the present and future. At OSSBA, we dedicated our fall region meetings to share the findings with school board members and superintendents and ask them to begin thinking about how to put the initiative to work in their districts. Several legislators attended the meetings and had their first introduction to For the People. In the coming weeks and months, we’ll be making a more intentional effort to share the recommendations with other stakeholders, including additional lawmakers, business leaders, policymakers and parent groups. As an association, we’re looking for ways to support school leaders as they begin to apply transformational principles at the local level. OSSBA and CCOSA also are asking school boards and superintendents to say “yes” to this new vision for public education and formally endorse For the People via a board resolution. The OSSBA’s voice at the Capitol will be a reflection of For the People’s vision and recommendations. To truly create a new day for public education, local board members and superintendents must be the voices of vision in their communities. Let us know how we can help. 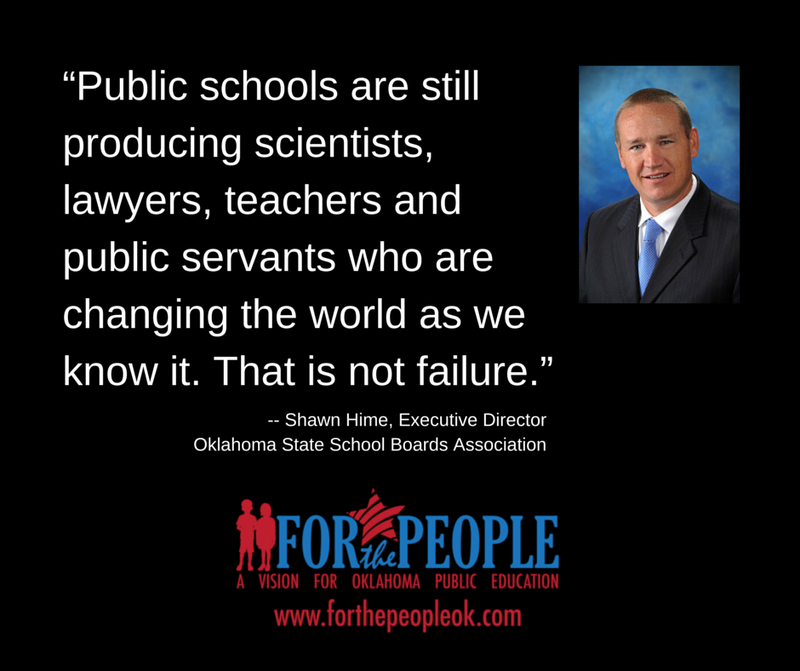 Hime is executive director of the Oklahoma State School Boards Association. This entry was posted in Uncategorized by christywossba. Bookmark the permalink.